Nicolas Poussin (1594–1665), The Birth of Venus (1635-36), oil on canvas, 97.2 x 108.1 cm, Philadelphia Museum of Art, Philadelphia, PA. Wikimedia Commons. 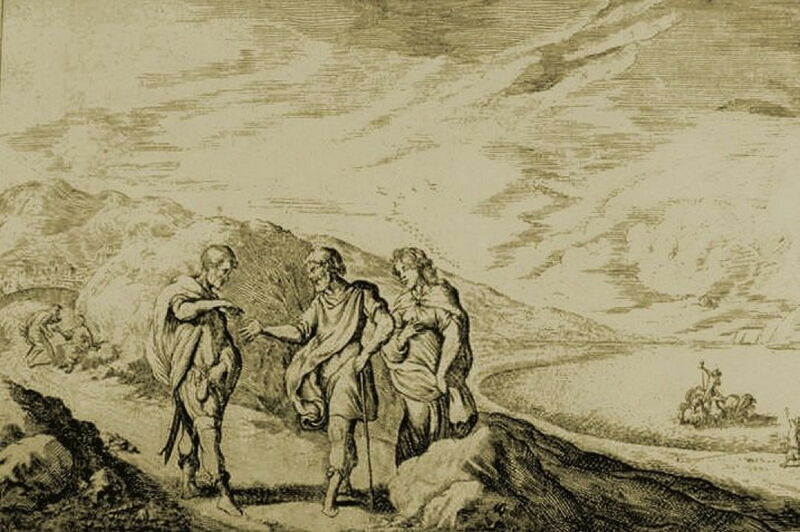 As Ovid draws Book 8 of his Metamorphoses to a close, Lelex has just told the touching story of Philemon and Baucis, who were transformed into an intertwining pair of trees, one an oak, the other a lime (linden). Achelous, who is hosting this banquet, then takes over as narrator, to tell of three examples of shape-shifters, who can transform whenever they want. or even — the foe of water — next a fire. This leads Achelous on to tell the longer story of another shape-shifter, the daughter of Erysichthon, who remains unnamed here, but elsewhere is given as Mestra or Mnestra. But he first has to introduce her father, by telling the story of his downfall. Erysichthon was an irreligious man, even desecrating the grove sacred to Ceres by chopping down a giant and ancient oak within it. As he prepared to swing his axe at the tree, it shuddered and turned pale. One man stood in Erysichthon’s way, and was peremptorily beheaded as a result. As Erysichthon swung his axe at the tree, its nymph warned him that her death would bring punishment on him. The other Dryads (wood nymphs) prayed to Ceres to punish Erysichthon. The goddess decided to bring insatiable hunger on him, but as it was decreed that Ceres and the goddess of hunger could never meet, Ceres sent an Oread as her messenger. The Oread found Hunger in the Caucasus mountains, and passed the message. Ovid then gives a detailed account of how Erysichthon was wracked with hunger, even in his dreams. Nothing could satisfy his appetite, and he spent his entire wealth trying to do so. Once he had run out of money, he sold his own daughter to raise money for more food. and cried out, “Hey, there! Expert of the rod! never know danger till they snap the hook! retraced his footsteps from the sandy shore. brought food, dishonestly, to ease his greed. his anguish burned him with increasing heat. and fed his body all he took from it. In the closing lines of the book, Ovid then reveals through Achelous the link to the start of Book 9: Achelous tells that he too is a shape-shifter, able to transform himself into a snake or a bull. But that bull has recently lost one of its two horns, which will form the start of the next myth. and started the myth of Achelous’ missing horn, to be continued in the next book. Amazingly, of those only two appear to have been painted or drawn by significant artists: both Hans Thoma and Cy Twombly have painted Proteus, but neither of their works is available to show here (I cannot locate an image of Thoma’s, and Twombly’s work is still in copyright). Johann Wilhelm Baur (1600-1640), Erysichthon Sells His Daughter Mestra (c 1630), engraving for Ovid’s Metamorphoses, further details not known. Wikimedia Commons. Johann Wilhelm Baur’s engraving showing Erysichthon Sells His Daughter Mestra (c 1630) is a fairly simple depiction of Ovid’s story, but has the interesting feature of Neptune, with his traditional horses and trident, down on the water to the right. Indeed, it is Neptune and water which provides a thread running through much of this narrative. For Neptune not only raped Mestra and enabled her shape-shifting, but he is the father of Proteus, the most adept of all shape-shifters, and both Achelous and Neptune are gods of the waters. Neptune has been painted quite frequently, but I can find no reference to him being shown with his son Proteus, nor with Mestra. But there is one painting in which father and son might appear together. Nicolas Poussin’s The Birth of Venus (1635-36) is controversial, as there is no general agreement as to what it is actually about, nor the goddess at the centre of the canvas. One reading maintains that its current title is correct, and the central goddess is Venus, who has just been born from sea foam. To the left is clearly Neptune (Poseidon), bearing his trident, and astride his horses. In the far distance, riding on the clouds, Venus’ chariot is being towed towards her by swans. There are other figures to identify, but one man in the distance at the left edge looks quite similar to Neptune, and could well be his son, The Old Man of the Sea, Proteus. An alternative interpretation is that it is not Venus at the centre, but the sea nymph Galatea, being drawn on a chariot of cockleshells by a school of dolphins. There is another, much more recent painting which appears to have been strongly influenced by Poussin: William Dyce’s remarkable fresco in Queen Victoria’s holiday palace on the Isle of Wight, Osborne House. 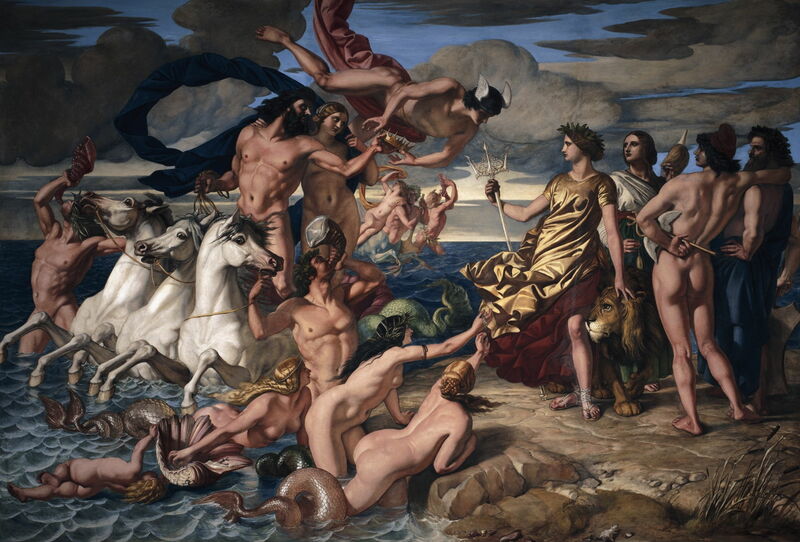 William Dyce (1806–1864), Neptune Resigning to Britannia the Empire of the Sea (1847), fresco, 350 x 510 cm, Osborne House, East Cowes, Isle of Wight, England. Wikimedia Commons. In Dyce’s Neptune Resigning to Britannia the Empire of the Sea (1847), Neptune stands astride his three white seahorses (with fish tails! ), holding their reins in his right hand, and passing his crown with the left. The crown is just about to be transferred by Mercury (with wings on his cap) to the gold-covered figure of Britannia, who holds a ceremonial silver trident in her right hand. Neptune is supported by his entourage in the sea, including the statutory brace of nudes and conch-blowers. At the right, Britannia’s entourage is more serious in intent, and includes the lion of England, and figures representing industry, trade, and navigation. 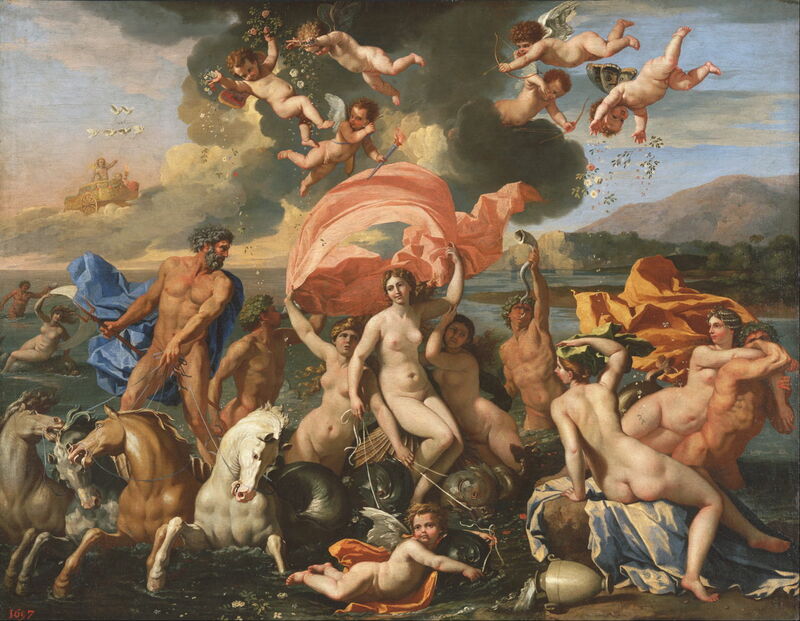 The depiction of Neptune, and much of the left half of the painting, has more than a passing resemblance to Poussin’s. But look into the distance, below Mercury and behind Neptune, and there’s an Old Man of the Sea with two nymphs. Could that also be Proteus, perhaps? I hope that you enjoyed the Poussin and the Dyce, and are as puzzled as I am that no one has painted any of these wonderful myths. Posted in General, Language, Life, Painting and tagged Baur, Dyce, Metamorphoses, myth, narrative, Ovid, painting, Poussin. Bookmark the permalink.